Christmas Day. What could be better than sitting down with the family to a Christmas dinner of turkey and the trimmings, Christmas pud, brandy butter, with presents and a slice of Christmas cake? Well, if you're trying to avoid animal products, then Christmas can be a particularly hard time for you. Sunday lunch may be a tradition that can stretch to a vegetarian alternative, but a turkey roast for Christmas dinner is as traditional as decorating the tree. So what can you do if you still want to pull all the stops out for Christmas, but you still want to avoid animal products? If you want a big blow-out dinner extravaganza, there are some great, luxury ingredients you can cook with that will tickle your taste buds and leave you as stuffed as the proverbial turkey. Nuts are a great luxury item that can make a terrifically tasty dinner for vegetarians. Find a recipe for a really good nut loaf and use that as an alternative to carve on Christmas Day. Brazil nuts make a great nut roast, as do pine nuts, or you can push the boat out with a luxury five nut roast using walnuts, hazelnuts, almonds, cashews and sesame seeds. How About A Vegetarian Roast? If your usual Christmas dinner includes pigs in blankets, you will need to find some vegetarian sausages, and skip the 'blanket', or wrap the sausage in a leaf of some kind - maybe pak choi, or a piece of cabbage. Roast potatoes are a must of course, but be careful to cook them in vegetable oil rather than lard or goose fat. Other traditional accompaniments, like parsnip, carrot, swede, Brussels sprouts, and so on, are of course all great for vegetarians, and don't forget chestnuts are another traditional favourite that will ensure you don't miss out on that flavour of Christmas, and just because you're not having turkey, doesn't mean you can't have cranberry sauce to accompany your dinner. 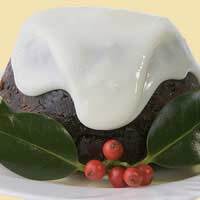 Christmas pudding is traditionally made with suet, which is a beef by-product, so be careful to find or make a vegetarian pudding. Vegetarian puddings can be made with soya milk and vegetarian suet to avoid eggs. Most shops stock some really delicious vegan puddings if you don't want to make one, but a home made one can include as much alcohol as you like! There are even recipes for 'no butter Brandy butter' so strict vegans can still make the most of a wonderfully rich dessert to round off Christmas dinner. Mince pies are a great favourite at Christmas time, and these sweet treats are easy to make vegetarian. Christmas cake is traditionally rich and full of eggs and butter, but vegans need not despair as it is still possible to make a fantastic and juicy cake with dates and nuts that's so tasty no one will ever know it's a vegan cake. Alternatively, there are a number of specialist websites that sell vegan cakes by mail order, so you can save yourself some time and have the cake delivered. To avoid embarrassment when opening Christmas presents, don't forget to tell your friends and family that you would prefer animal free Christmas presents, and you could remind them of the kinds of things this includes. To be on the safe side and make everyone comfortable, you could write a list of things you'd like for Christmas. You could even suggest where to shop for them, that way, even if someone buys you cosmetics or toiletries, you can still be sure they're animal friendly. Gently suggest that you would prefer not to receive leather purses, wallets, handbags, gloves or belts, silk scarves and handkerchiefs and certain kinds of woollen jumper. It may feel odd to give someone a list or make a specific request for a present, but it will be easier all round and takes the hassle out of shopping, if the gift giver knows exactly what you want - and that you'll be delighted to receive it. Okay, so there's no surprise, but it saves duplicate presents or disappointment over something you didn't want. Following these simple suggestions should ensure you have a wonderful and indulgent Christmas, safe in the knowledge that you've remained animal free, and of course there's one Christmas tradition that's completely safe for vegetarians and vegans alike - you can still have the biggest, brightest Christmas tree possible.